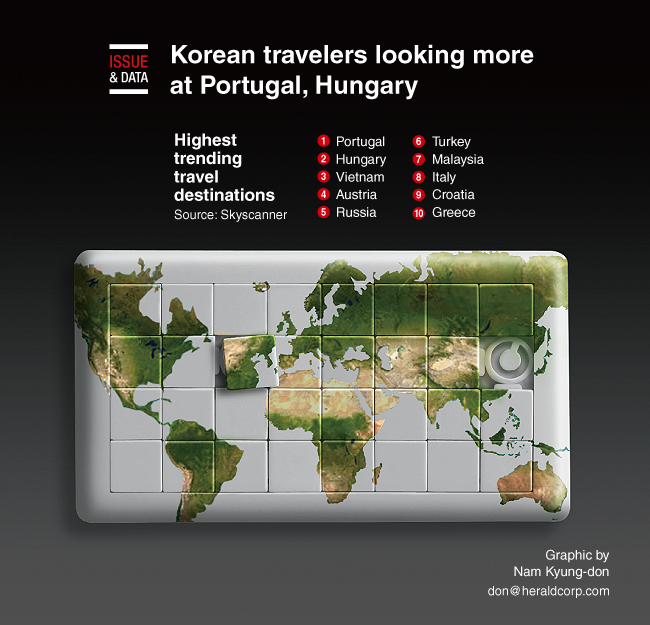 South Korean tourists’ interest grew the most for Portugal and Hungary over the past year, although Japan, Vietnam and other nearby Asian nations remained steady picks, according to a travel fare website. Skyscanner analyzed internet searches of travel destinations from October last year to September this year and found that searches for Portugal increased 93 percent compared to the previous period of the same months. Searches for Hungary were up second most, jumping 74 percent. Other increases included Vietnam (46 percent), Austria (44 percent), Russia (42 percent), Turkey (39 percent), Malaysia (25 percent), Italy (23 percent), Croatia (20 percent) and Greece (20 percent).